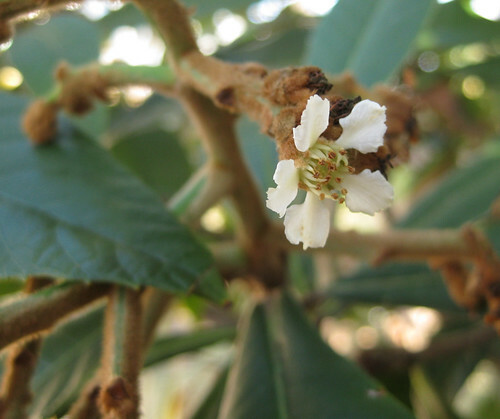 Closeup of loquat flower on New Year's Day. 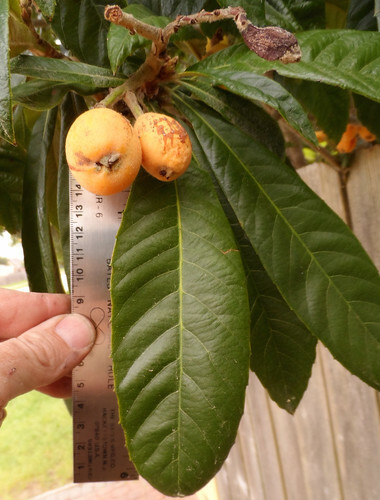 Ripe loquat fruit on tree. 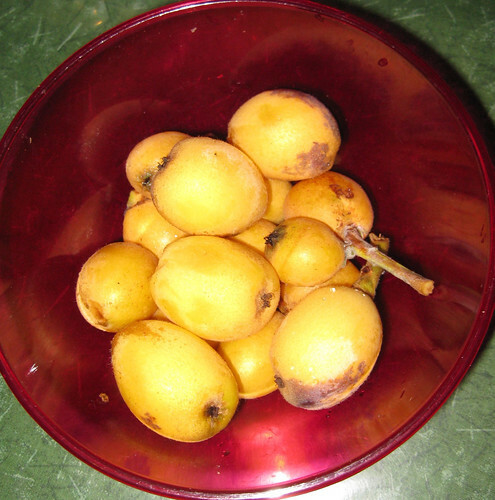 Ripe loquat fruit artistically displayed in a bowl. 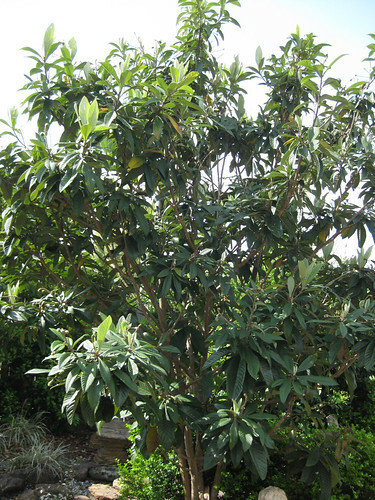 Loquat trees have a tropical appearance yet are evergreen and can handle cold weather down to 15-20 degrees Fahrenheit. 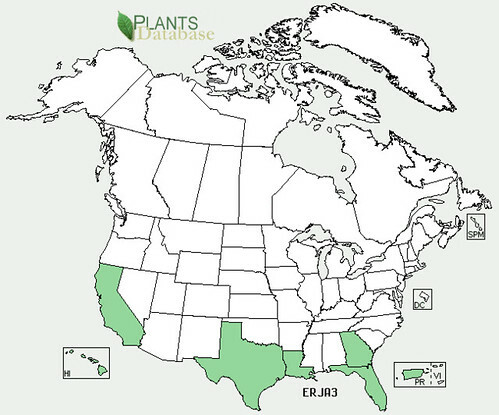 They are a common landscaping tree in Houston and thrive here. Their golden fruit ripens in late spring with the best crops coming after a cool winter. They are self fertile which is convenient for homeowners. The fruit has an elongated shape but is smaller than a golf ball and contain 1-3 fairly large, inedible seeds. They have a sweet, tangy taste and can be eaten in many ways including raw, candied, stewed, made into jams, jelly, or wine or dried. Some people prefer to peel off the tart, fuzzy skin. A tree over seven years old can produce up to 110 pounds of fruit each year! 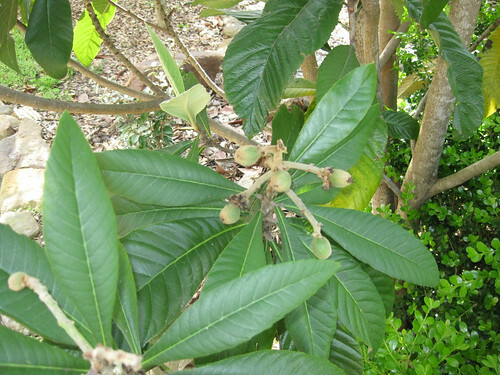 Tea made from loquat leaves is considered a strong medicine in Asia. Besides containing large concentrations of vitamins, minerals, and antioxidants they also contain amygdalin which is believed to help repair liver damage/increase liver functioning. For diabetics, loquats leaves contain triterpens (tormentic acid) and assorted polysaccharides, both of which may stimulate insulin production which is beneficial for diabetics. Leaves and creams made from the leaves were placed on skin cancers and loquat leaf tea was used to fight internal cancers. 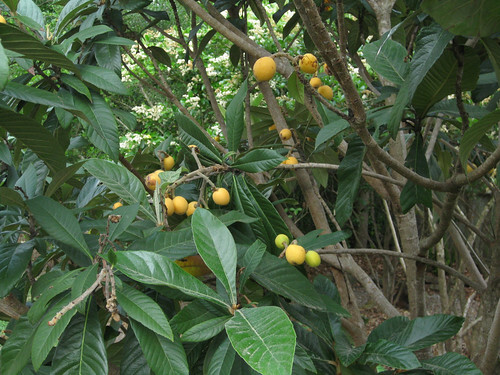 The seeds of loquats can be used to create an amaretto-flavored liquor. Add 5-7 chopped loquat seeds to 1 liter of 90-proof or greater alcohol lad let soak with shaking for six months. After six months strain out the seeds and add up to 250 mL of sugar water (1 cup water + 1 cup sugar) to sweeten. Base the amount of sugar water on taste...but don't drink all your liquor while trying to get the proportions right!